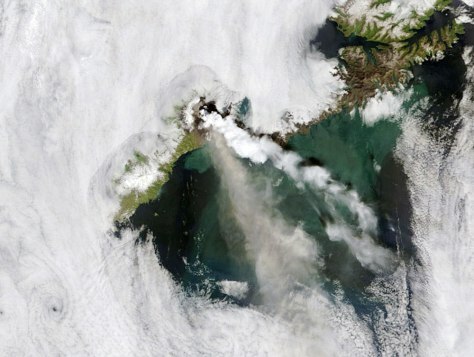 This satellite image from Sunday shows the Okmok Caldera erupting on Umnak Island in Alaska. Viewed through a break in the clouds, both a steam plume, right, and an ash plume emanate from the volcano. The steam is snowy white like the nearby clouds. The ash is slightly darker. The blue-green color of the nearby ocean water may result from volcanic ashfall.